Hi! It is Christmas Eve here and we have been having a great day! Being a blended family it is sometimes difficult for us to be all together for long on Christmas Day, so we have started our own tradition of us being all together having lunch on Christmas Eve. We normally open one present and save the rest for Christmas Day, we all had a lot of fun and laughs. Even though it is Christmas Eve, I don't have a holiday card to share today. 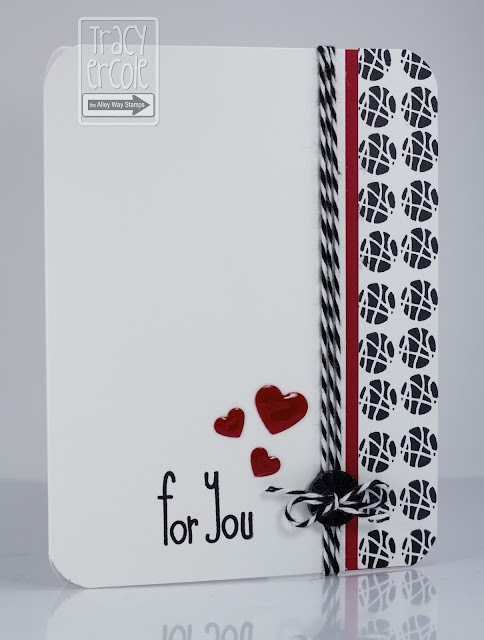 I made this card with my husband in mind, I used the sets Jibber Jabber & Doodle Frames from The Alley Way Stamps. I am sad writing up this post as it will be my last for The Alley Way Stamps, things are a little hectic in my home and work life right now so I decided not to continue for another term, which was a really difficult decision. Alison and all the DT girls are amazing and I am so thankful I was given the opportunity to be part of such a fantastic team. I can't wait to see what fantastic sets you come up with Alison! Tracy this is absolutely stunning! !